convey important information that, if you do not read thoroughly, may lead you to be penalised or disqualified. Please note that all main junctions will be marshalled but please be aware that marshals cannot stop traffic and the race is run on open roads so it is your responsibility to cycle safely. Anything deemed to be unsafe will be recorded by marshals and the race referee will impose a time penalty or disqualification, as appropriate. You will be allowed to enter the water at 7:20am to warm up. 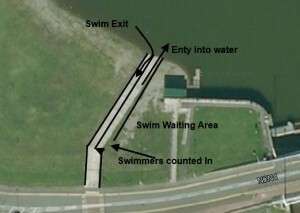 All swimmers will enter via the slipway. There will be a designated waiting area for those in the later waves and you will have to enter the water as shown in the diagram so that we can count you in. Please take care on entering and exiting the water. There is now plenty of sand on the entry point thanks to the winter storms so a soft entry and exit from the water. The swim course will be one lap of 750m, anti-clockwise. You will start in the water at the designated location which will be visible on the day. Water safety cover will be provided – if you get into difficulties, turn onto your back and raise one arm in the air, and help will be with you quickly. The North Dock is ideal for first time open water swimmers. The maximum depth is approx 5’ 10” at it’s deepest. It is possible therefore to stand up in the water if in any difficulty. 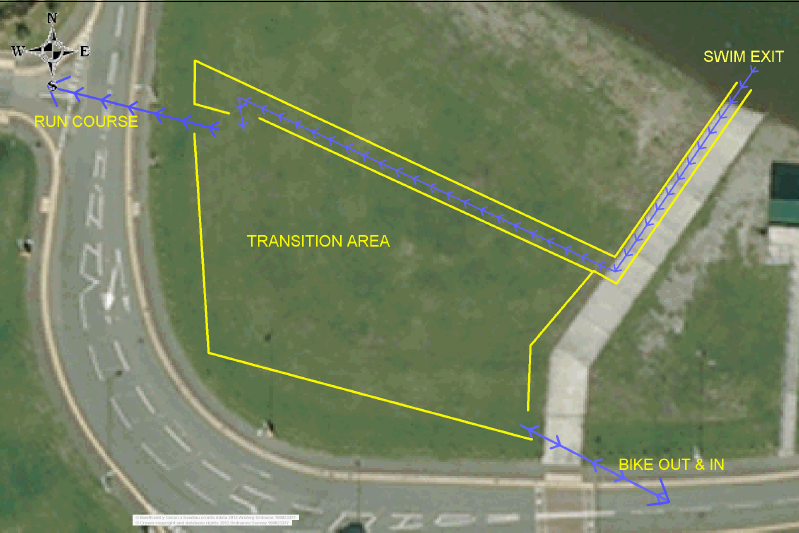 After mounting your bike at the designated line you will take the first left exit at the roundabout (0,5m). The same will apply at the second roundabout and this will take you over the railway line and toward the third roundabout at 1.5m. You will take the second exit here and head down to Kidwelly. You will travel straight through the next two roundabouts as you head through Pembrey towards Kidwelly. 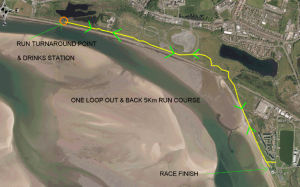 The main roundabout on the outskirts of Kidwelly is the turnaround point for the Cycle course and you then re-trace your steps all the way back to the North Dock. The Cycle course will be clearly signposted with Large Yellow fluorescent arrow signs and we will have marshalls on all key junctions. It is however your responsibility to be fully aware of the cycle course before hand. ( A Large scale map will be present at Registration) The highest point is only 50m above sea level so this is a pretty flat fast bike course. On exiting transition you will cross the road onto the pavement and then cross the road again as instructucted by marshals and onto the Millennium Coastal Path. You will keep left and run over the railway bridge and follow the path down to your left. You will follow the path towards the Pwll playing fields. This is now a straight out and back run. The turnaround point will be clearly marked and marshalled. The first runner out onto the course will also have a lead cyclist. The course will also have Km markers. There will be a drinks station on the run turn. The transition area will be located by the North Dock. Transition area will be open for racking of bikes at 6:000am and will close at 7:15am. NO BAGS/BOXES can be left in Transition.The transition area will be protected by barriers and entry will be for athletes only who have registered. The racking will not be numbered and bikes should be racked by the saddle. You must place your wetsuit next to your bike after the swim and it must not be left where it can impede other athletes. A one way system will operate in transition. 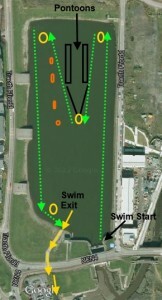 You will enter from the bottom end of transition from the swim and exit at the bottom end with your bike. You will be instructed by the marshal when to mount your bike. On return from the bike you will dismount as instructed and enter transition from the top end and exit for the run from the bottom end. Please obey rules above where appropriate in transition.